On the way to centralisation of EPF accounts ;which was one of our long pending demand , CGMT Kerala Circle issued instructions to all SSAs for keeping a single EPF establishment code. Pending Transfer Orders of JTO/SDEs issued today. The continuous persuation and followups by AIGETOA Circle team helped in materialising the long pending Request transfer in the case of JTO/SDEs benefiting our members from various SSAs. AIGETOA Circle team sincerely thank and express our gratitude to CGMT Kerala, GM (HR&Admin) and DGM (HR&Admin) and HR Section for issuing the transfer orders favourably. AIGETOA Circle team extends our warm support to AIBSNLEA Kerala Chapter for their effective coordination and sincere cooperation in this regard. Meeting was held at O/o CGMT today regarding pending request transfer cases with circle management, along with other associations. After marathon discussions, AIGETOA Circle team trying to get things done for all our member's cases positively. DR Unity Zindabad. Details will be informed soon. 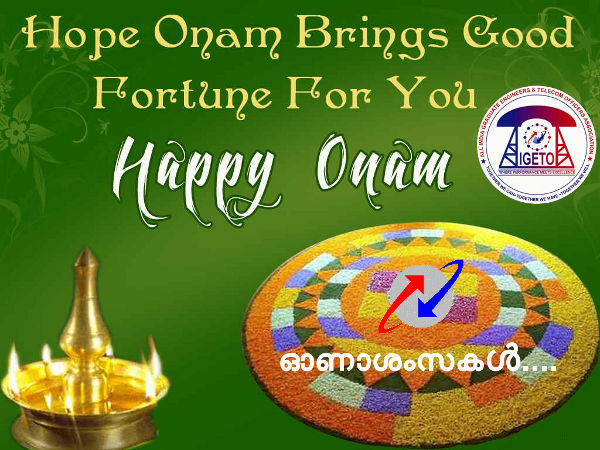 Corporate Office recognized Kerala and Orissa Circles which are following CMTS division in circle office performing better than other circles which is following decentralized maintenance. BSNL Corporate Office constituted a Committee to study Mobile Services merger with SSA's and asked to submit the report by 12th September. Till then existing practices will be continued. 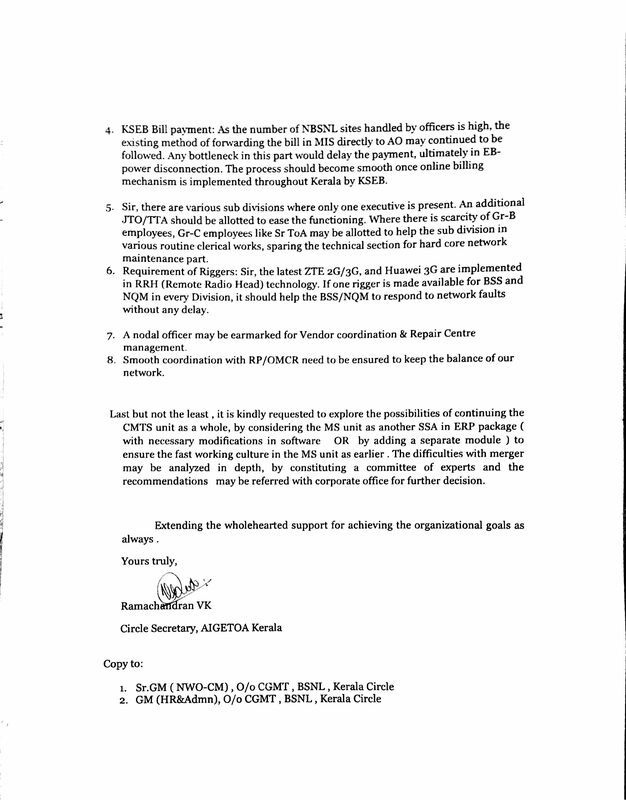 Our Circle Team submitted letter to CGMT, Kerala in connection with suggestions on modalities to be followed by SSAs while merging Mobile Services with SSAs. Further we requested CGMT kindly to explore the possibilities of continuing the CMTS unit as a whole, by considering the MS unit as another SSA by making necessary modifications in ERP package . Click here for the letter submitted Page2. Mobile Service officers transferred to respective SSAs due to merger of mobile service unit with SSAs. DOPT case - next hearing scheduled on 9th October 2014. Limited Departmental Competitive Examination for promotion to the grade of SubDivisional Engineer (Telecom) for vacancy year 2010-2011 onwards under 33% quota circulation of syllabus, scheme and minimum pass marks. LDCE Notification is expected shortly. Details will be uploaded soon. Due to non availability of division bench at honorable CAT, EKM the DOPT case didn't came for hearing today. In the light of latest judgement by Hon. Supreme court in the SDE gradation list, the DoPT case takes more importance for (Direct Recruits). Next date will be announced soon. AIGETOA circle team (Shri. Saheer. S, ACS & Shri. 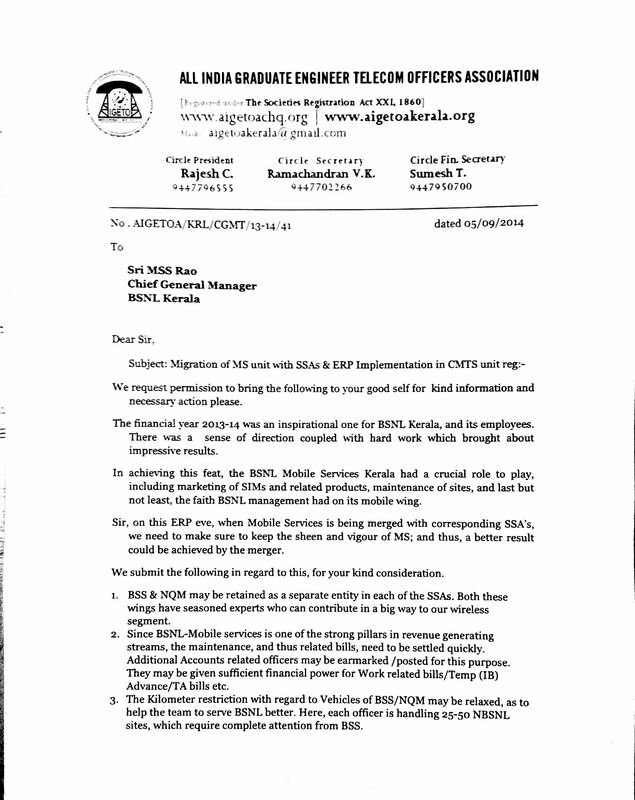 Hari.S ,DS, TVM) met CGMT Kerala on 16.08.2014 in connection with pending transfer requests of Dr executives who are working outside their native places for more than four years. CGMT assured us that the request will be considered on merit after getting clarification from Corporate Office. The circle executive of AIGETOA KERALA held at AMMU REGENCY Thrissur on 09/08/2014. The meeting discussed various issues of our members and issues in general. The house has decided to entrust the Calicut SSA regarding the handing over of the fund collected in the name of Late Sri. Anil George JTO BSS wayanad. The house had unanimously decided to nominate Mr. Ramachandran V K SDE NSS Calicut as acting Circle secretary . The house approved all the above nominations . The house expressed its strong resentment towards the AIGETOA CHQ regarding the recent updates in the CHQ website with respect to an agitation by some other association and requested the CHQ to take the circle in to confidence before coming to a conclusion in such cases in future. The circle committee decided to nominate the following circle committee members for attending the AGM to be held at Hyderabad on 22 and 23rd August 2014. The committee decided to follow up the pending transfer case of our members at circle level. After the circle committee meeting the coordination meeting with AIBSNLEA also held in the same venue. Circle Level Co-ordination Committee of A.I.B.S.N.L.E.A & A.I.G.E.T.O.A has been constituted in Kerala in a combined meeting of circle office-bearers of both the associations, held on 9-8-2014 at , Trichur. AIGETOA Circle President Sri.Rajesh welcomed all the office bears of both the association and briefed about the recent developments which leads for such a co ordination and emphasis the need of the hour. Sri. Mangalandan Circle secretary AIBSNLEA have detailed about the coordination and the recent developments pertaining to Kerala circle. Treasurer - Sri. 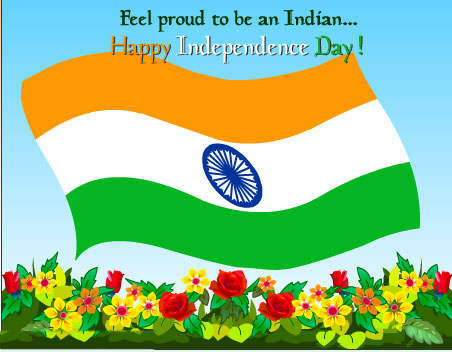 K.Vijay, SDE Intl, MLP ( District Secretary, AIGETOA, MLP). All office-bearers / members of circle executive committees of both the associations will be members of the co- ordination committee. The meeting decided to take up all common issues jointly, as stipulated in the MOU between the two associations. State-wide campaign in connection with referendem for membership verification will be arranged by this coordination committee in liaison with the local co-ordination committees. All District secretaries are requested to contact the AIBSNLEA District office bearers to form the co-ordination committee at SSA level at the earliest.